When I think of Christmas and New Year partywear I think sparkles, sequins, velvet and glam. Everything over the top and a little bit extra. Sometimes it’s nice to go glam, but equally sometimes it’s also nice to go a little understated too – not your expected festive do outfit can feel just as magical. That’s what I’ve found with this little number. Don’t get me wrong, I love a bit of sequin and sparkle at Christmas time, and you’ll definitely be seeing me in the most extra sparkly dress possible at my work do this week. But, it’s nice to get that same feeling in something a lot less expensive, and something that ultimately you’ll get a hundred more wears out of throughout the year. 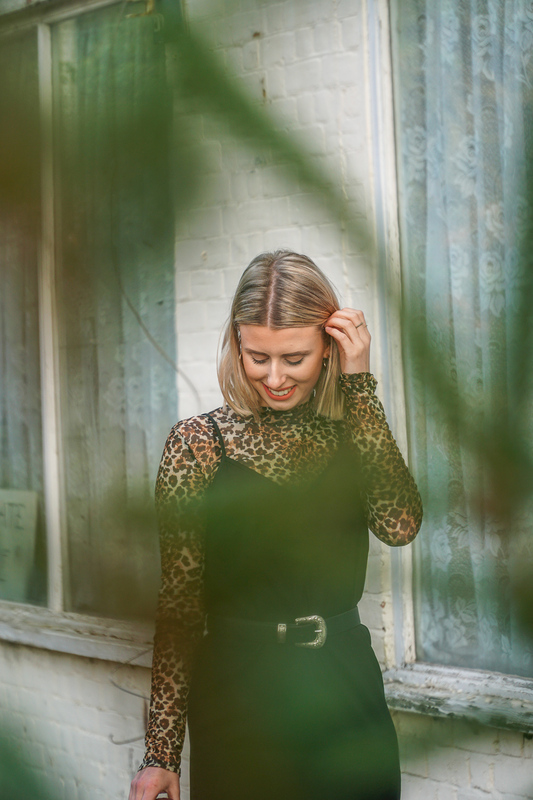 I picked up this leopard print mesh top in the sale in Urban Outfitter when I was in Bath at the beginning of the month and knew instantly it would be a winner. Paired with my classic cami dress from ASOS (every girl needs one of these dresses in their wardrobe – they layer perfectly with pretty much anything and everything), snatched in with my belt and it’s a winning outfit. I added my new sock boots – these were an absolute steal from Nastygal’s 50% off sale, and took my cross-body bag (I love the fluffy handle on this!). I don’t know what it is but chucked altogether this just felt like one of those perfect outfits. I feel confident, sassy, and dressed up without being too much. The best part of all? Trade in the boots for some trainers and this will be the perfect daytime outfit too. One of the worst things about festive outfits is that you can only get them out once a year – this one? You’ve got hundreds of wears out of it. No chucking it to the back of the wardrobe only to be discovered again in 11 months time..
What’s your favourite understated festive outfit?